6 AM, my alarm cut through the quiet of the night. I groggily woke up, trying not to rustle my friend beside me in the car. My night was pretty restless, filled with tossing and turning, too excited to climb to get any real sleep. This was going to be the day. I was finally going to climb Corrugation Corner. This climb first came onto my radar when my friend, Jeff, wanted to get in some multipitch in preparation for climbing Leaning Tower. But somehow we missed the exit for Highway 50 and ended up at Donner instead. The second time, my partner, Miguel, and I had to be back in San Francisco by 5pm to drop our other climbing friend off at the airport. We woke up too late, botched our approach, and there were several parties on the ground and on the route. The third time wasn’t quite the charm either. Nobody in my party felt confident enough to lead the climb. This time, the fourth time, it was gonna be it. I knew it. 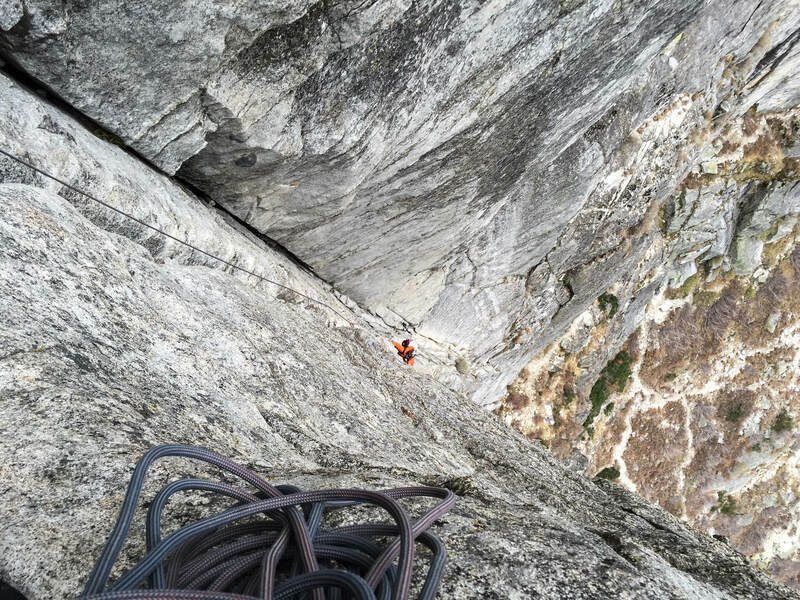 Corrugation Corner is a classic 5.7 at Lovers Leap. On any given weekend, you’ll be climbing above and below other parties. It requires an alpine start, maybe even earlier, depending on the time of year, to beat the crowds. At 6am in the darkness, we were the only ones awake at the campground to begin the approach. We packed our packs and racked our racks the night before. Miguel broke down his camp and I made peanut butter sandwiches for breakfast. We didn’t even bother brushing our teeth. We wanted to be first on Corrugation Corner. Since we had gotten lost the last time, we took extra care to find the use trail that traveled by Lower Buttress. We didn’t get off trail. We didn’t get stuck on any random talus fields peering up at where we needed to be. We didn’t slip and slide down loose gravel. It almost seemed like things were in our favor this time around. How did we miss this the time before? The sky lightened but we saw no signs of other people. Soon we were by Traveler Buttress, huffing and puffing as fast as we could to the Main Ledge. And then we were on the Main Ledge, staring down Corrugation Corner, talking through our game plan. It was 7:20 in the morning. We were alone at the base. This was actually going to happen. I nearly peed my pants. I was going to finally climb Corrugation Corner. A 5.7 generally isn’t intimidating, but Corrugation is. Three steep pitches of slightly runout climbing awaited us. Miguel swapped his approach shoes for his Mythos. I clipped my ATC into the rope and off he went on the first pitch, slowly and steadily. Then I was on belay. 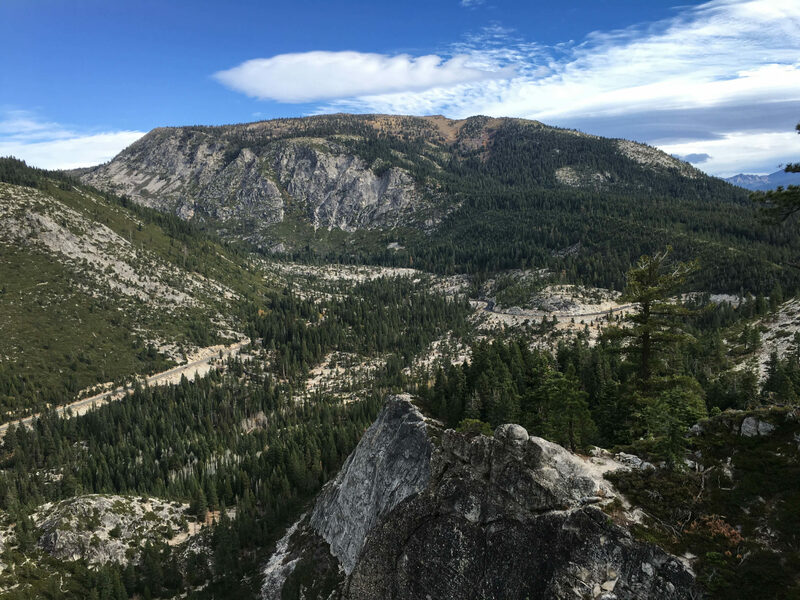 I took a deep breath, tossed on my trusty Scrambler 30 with all our shoes and snacks, and started to climb. The first pitch was uneventful. I thought to myself that I could lead it. 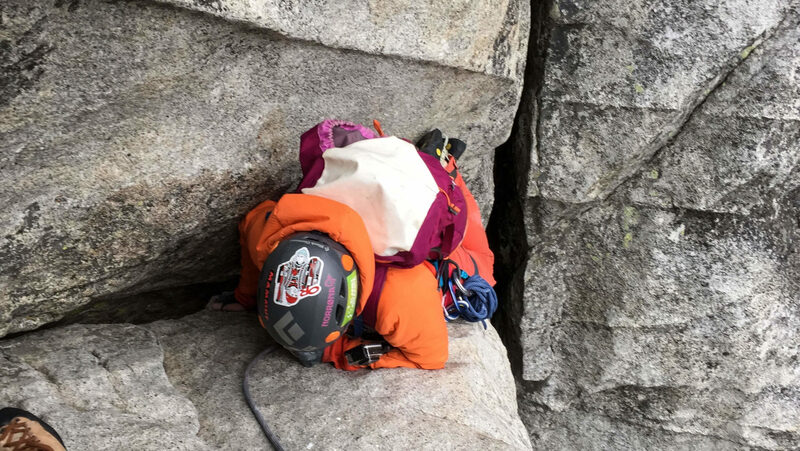 It was nothing I couldn’t do with a little bit of confidence, and maybe a few more times on the route so I could memorize all the movements and placements. I reached our first belay ledge and high fived Miguel. We were actually freakin’ doing this. Stoke was high. We flipped the rope over and Miguel set off on pitch two, the arête and beached whale pitch. We were still alone on the wall. I kept my eye out for climbers making their way up on the approach. I couldn’t believe that at 9am, we were still the only ones up here. It was a chilly and slightly windy morning, but nothing too extreme. Maybe the climbers we saw at Strawberry Lodge the night before decided to sleep in. Better for us anyway. Miguel was safe. All the slack was taken in. Belay was on. Out of the corner of my eye, I saw two parties scoping out the climb where we had stood and marveled. We finally had company just as I was about to begin the second pitch. I wondered if they would catch up to us so maybe we could make friends. I had recognized a few people from my climbing gym in San Francisco the night before. But the thoughts were fleeting, and I set off to do battle with pitch two. A solid hand jam, an airy but juggy arête, and a beached whale are what summarized my second pitch. Pitch two followed a solid crack system, allowing me to practice my horrid crack technique. None of it was particularly memorable other than this one killer hand jam. And then it was the arête which Miguel shouted to me that I would love. Did I love it? I’m not sure. Maybe if I climbed it again, I could tell you. But I’m not sure. I’m not a fan of arêtes (yet?). I felt a little exposed. My slight fear of heights kicked in. I told myself to breathe and to not look down that much. And then I was unclipping my slightly less shiny Petzl draw from a piton. It was beached whale time. I told myself I would do it gracefully. Beached whales are for the birds. It wasn’t graceful. Not by a long shot. I got a few solid holds in. Then nothing. Maybe I am too short. Or maybe there was actually nothing. I stood there for a good few minutes debating on what to do. And then I said oh hell, and I trusted the ledge and I flopped onto it. Squeezed onto this little ledge with a slightly angled rock on my right, I was so terrified of accidentally rolling off, even on top rope. But by grace of some higher power, I didn’t. There we were at the top of the second pitch of Corrugation Corner, slightly freezing but all smiles and high fives. The belay ledge was a little slippery and angled. Miguel had set up the anchor so he could film me in all my gracefulness. 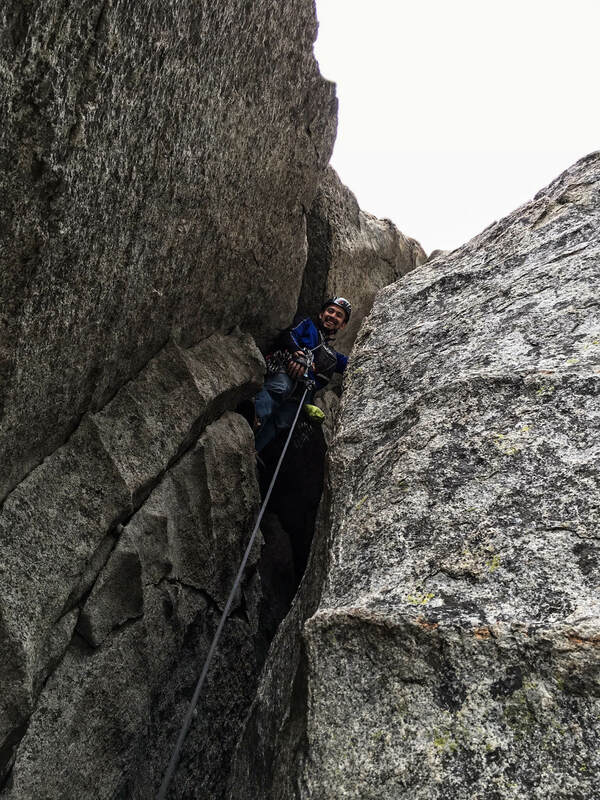 We took a few minutes to readjust the anchor to a more belay-able position and transition the rope to me. Then he set off to scurry up the chimney and dike hike as I belayed him, trying not to fall off or freeze on this ledge. Then it was my turn to climb the home stretch. I quickly cleaned the anchor and then climbed up into the chimney. It’s a nice and short chimney, but I regretted the “massive” pack I had on my back. I regretted volunteering to take Miguel’s shoes with me. And then it was the airy traverse. But it was a short and solid traverse, so I didn’t even really notice, aside from the minimal amount of gear I had to clean. Then suddenly I was dike hiking on solid holds and feet. There wasn’t much pro for me to clean, but everything was super solid, and it was okay. I could totally lead this, I thought to myself. Miguel yelled at me to smile, and I saw him taking photos or videos or something. And then I scrambled up the last few feet and nearly collided with my climbing partner. It was the end. I had done it. We had done it. Corrugation Corner was something I could finally tick off my list. 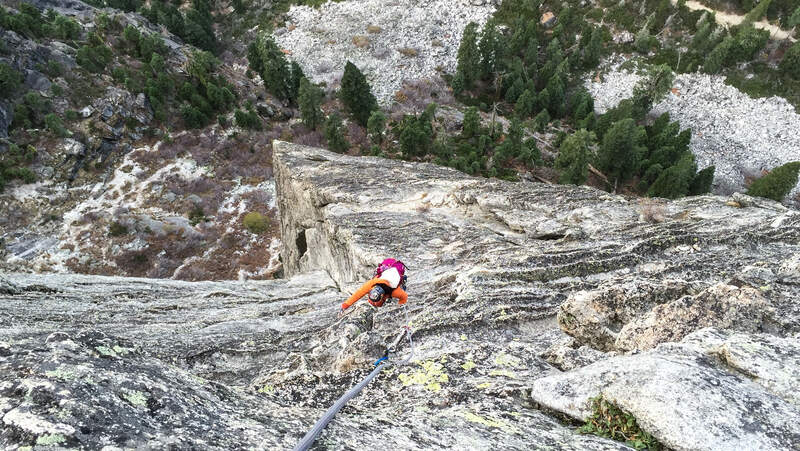 I finally did Corrugation Corner, one of the classic Tahoe climbs!!! We high fived, took a few selfies, ate some snacks because man, my tummy was growling, and then high fived some more. We were pretty much the only ones on the wall and it was absolutely stellar, even if it was slightly nippy. We climbed it, completely alone. It was amazing. It was awesome. It was something to put in the books forever. Then we set off on the descent to go find our friends. Next time? I’ll be leading it. Maybe.